Good to see everyone bouncing back so well from the events of the season finale! Now they can all go back to their normal lives…stalking each other from the trunk of a car that’s heading to England. Yes, our dynamic duo is still reeling from the first season finale, which, per the show’s timeline, occurred only 30 seconds ago. In some ways, it’s hard to imagine where the show can go after the first season. The cat and mouse game ended up with one of them stabbing the other, and after the incredibly charged conversation they had at the end of the episode, some of the tension has been let out of their relationship. They’ve found each other, done their worst…and split up again. How can the suspense get ratcheted up again when we’ve already seen what happens when they meet? Eve’s eventual conversation with Carolyn late in the episode about rejoining the mission has a definite whiff of sequelitis to it—she has to get back on the case, because Villanelle will come looking for her one way or another. It’s a reset back to the circumstances of the first season, but with some minor tweaks along the way. Of course, this is only the premiere, so there’s still plenty of room for the show to branch out a little more. And even if there’s a bit of a déjà vu, there’s still so much to enjoy in here. 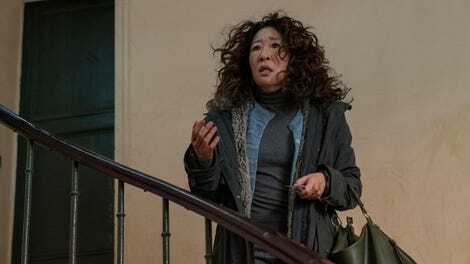 Sandra Oh’s performance as the crumbling Eve, who’s swinging wildly from euphoria to crying in the bathtub, is as devastating as ever. Jodie Comer’s work is excellent if stranger, because Villanelle is very odd, but Oh has to make us believe in Eve as a normal person…with a very dark side. Eve has to seem like someone you might know: funny, smart, a little adrift. And her long slow confrontation with also being the sort of person who would stab someone, and stab someone else when it wasn’t even self-defense, seems likely to play out over the course of the season. And Comer, as ever, makes Villanelle into the world’s cuddliest assassin. The show switched showrunners after the first season, with Fleabag’s Phoebe Waller-Bridge departing and Emerald Fennell taking over, and Fennell clearly has a sense of the give and take of Villanelle’s charms. It’s all fun and games watching Villanelle swap one liners with an injured tween, alternately breaking his heart and cheering him up, until you remember that she could impulsively decide to murder him. We may like this person, but the show is as fond as ever of pointing out that she’s a monster. Do you find yourself hoping she and Eve will work things out? You shouldn’t. And yet here we are. Their complicated, intense bond figures to be as bewildering to those around them as ever. One of the bigger developments of the premiere is Carolyn making very clear that she knows Eve can’t be trusted when it comes to Villanelle. Not that Carolyn can be trusted either, of course—as pointed out by Carolyn herself, they’re both keeping some secrets. For now, they need each other. That Eve is already protecting Villanelle from Carolyn doesn’t bode particularly well for this boss/employee relationship, but at least Eve is back on the payroll. Which poor, suffering Niko immediately gives her a pass on. Poor Owen McDonnell has one of the more thankless jobs in television, portraying the kind man fated to seem like a totalbuzzkill in comparison to Villanelle. He’s never even suggested threatening Eve with a knife. Because men stab, don’t they? Not women? One of the best, most unnerving moments of the premiere is Villanelle’s slow, queasy smile as she reminisces about how Eve surprised her in that moment. “She did it to show me how much she cares about me,” she proclaims to poor Gabriel, and the scariest part is, she’s probably right. Let’s hope Eve straight up burned those socks. “You’re funny.” “Yes. I am funny.” We should all learn to take a compliment like Villanelle. Villanelle had a whole series of great one liners in the hospital scenes, from telling Gabriel “That’s not helpful to me” when he says his parents died to the hilariously unlikely “I fell off a horse” excuse when someone asks her how she got hurt. One of the bleaker elements of Villanelle’s psychosis: She wouldn’t have killed Gabriel if she wasn’t experiencing empathy for him. Doing so makes her own escape more complicated. But to her mind, his life would be hard. And he seems nice. So she did him a favor. Though it’s just as easy to imagine her killing him out of annoyance if he’d been less helpful. There were a couple of very on the nose moments in this episode: the tutu in the trash bag, the very meta conversation about addiction when clearly Eve does have addictive behaviors towards Villanelle, the cap Villanelle is wearing that says “LOL.” Similarly, I was on the fence about the very tongue in cheek nods to Villanelle’s love of high fashion, from the eyeroll about the Crocs to the surprisingly well-tailored pajamas. But I’ll take meta Killing Eve over no Killing Eve any day, and I’m so glad it’s back.